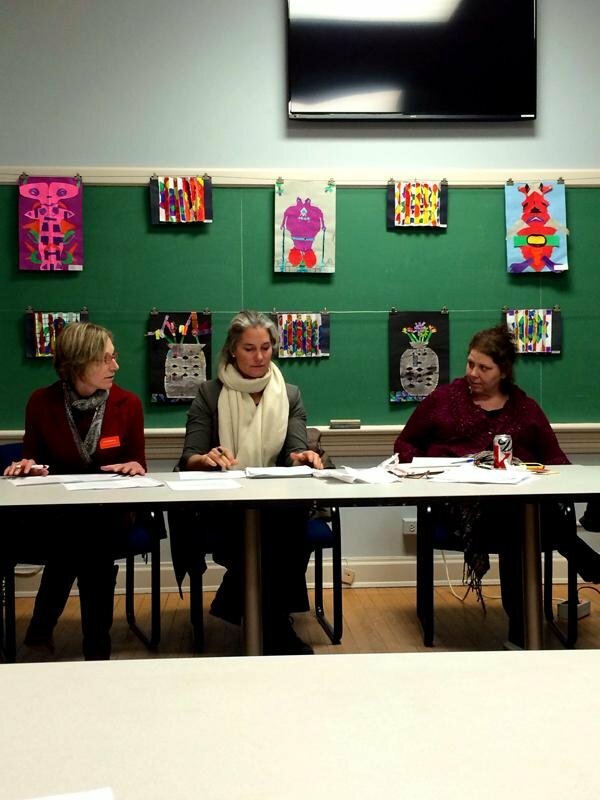 Cultural arts coordinator Jennifer Lasik (right) talks at an Evanston Arts Council meeting in 2014. The Evanston Arts Council recently awarded grants to 12 recipients. The Evanston Arts Council awarded grants to 12 recipients Friday as part of the 2018-19 cycle of its Cultural Fund Grant Program. According to a Friday news release from the Arts Council, the program’s funds were provided by the city, which distributed $30,000 in total to various awardees. Five received $3,000, two received $2,500 and five received $2,000. The beneficiaries fall under three program categories: individual art projects, special programs and specific organizations. “The goal of the program is to sustain and advance our community’s visual, performance, literary and media arts and to activate the extraordinary assets of the community to develop Evanston as an arts hub and destination,” the release said. The Evanston In-School Music Association — one of the organizations that received $2,000 in funding — aims to bring high-quality music ensembles of varying genres and cultural backgrounds to perform at elementary and middle schools in Evanston/Skokie School District 65, executive director Annalee Letchinger said. She said the grant EISMA received will help compensate the ensembles they select. Letchinger said the organization has recently faced trouble paying musicians, causing it to choose ensembles with lower membership sizes to perform at schools. She added the grant would help EISMA bring in groups of four musicians for at least one of the series of 28 performances each season. “We are very grateful to (the Evanston Arts Council), because we’ve been struggling to be able to come up with enough money to pay the musicians anywhere close to the rate that they really should be compensated for,” she said. The Evanston Symphony Orchestra was also granted $2,000 in funds from the program. Penelope Sachs, a viola player and Symphony board member, said the process of applying for the grant was a fairly straightforward and easy one. The grant will act as a general operating support for the Symphony, with funds going toward the cost of producing concerts, she said. One of the organizations to receive $3,000 was Mudlark Theater, a not-for-profit theater in Evanston that aims to collaborate with young people and “raise the bar” for what teens and preteens can achieve as artists, Mudlark executive director Michael Miro said. Miro said the application process for the grant made it apparent the Evanston Arts Council looks to support organizations that promote inclusion, equity and community outreach. Mudlark’s policy of helping children regardless of their family’s income, he said, was one of the factors for why it was chosen. Miro added that the grant — which also can provide general operating support — is instrumental for helping organizations like Mudlark in achieving their objectives. “We wouldn’t be able to do our mission, our highly ambitious theater with young people and have (our) unconditional scholarship program without the support of local institutions like the Evanston Arts Council,” he said.